PATCH: Same NHC changes, another file to patch; see downloads for the patch. PATCH: The NHC made a slight change to their products, and the filter needs two files to be replaced. See downloads for the new files. The WX-ATLAN e-mail list, the source of data for all you Unix users out there, has CHANGED. You will have to re-subscribe and set your sub-topics on the new site. The information on doing so is here. Assuming you've used the procmail rules I show below, you should not need to adjust them at all. 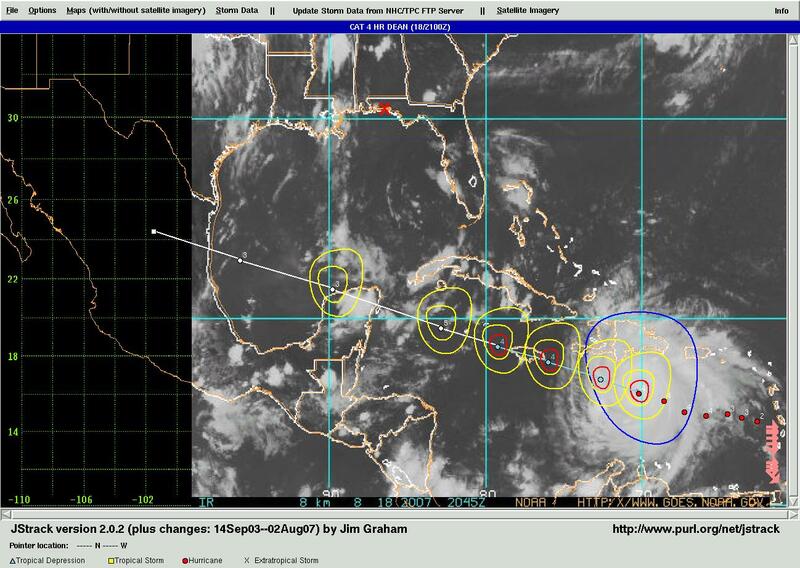 JStrack is a freeware hurricane tracking program. It's currently tested under Unix and Windows (i.e., what I have access to). Here is a sample of JStrack's main display from 18 August 2007 at 2100Z showing not only the track of Hurricane Dean, but also one of the new features in JStrack—the ability to overlay GOES-East imagery directly onto the tracking chart. NOTE: If you use IE, and have it configured to reduce images to fit the browser window, I strongly advise you to turn that off and use the scrollbars...if I remember correctly (I don't use IE) it's under the "Advanced" tab. Otherwise, IE's scaling of the image will make it look terrible! It's written in Tcl/Tk, and is the result of my not being able to find a freely available hurricane tracking system for Unix. Note that while it was originally designed for running under Unix, as of version 2.0.0, it is now MUCH more friendly towards people running it under Windows (Windows 9x/NT/2k/ME/XP)! As before, it should run on any other system for which Tcl/Tk is available (Mac users—I don't have a Mac, or access to one, so any feedback and/or help you can offer would be appreciated). I've created an e-mail discussion list for JStrack users (and myself) at jstrack@googlegroups.com. To subscribe or unsubscribe, see JStrack e-mail list instructions. 11 October 2010 Update: JStrack 3.3.2 is out. Version 3.3.2 is a bug-fix release from 3.3.1a. 19 September 2010 Update: JStrack 3.3.1 is out. Version 3.3.1 changes the FTP updates from the NHC's old, legacy FTP server, which is a much lower priority when down, over to the http server, which is on a newer, better system and has a much higher priority. It also adds some new EXEs for the windows EXE users. 13 September 2010 Update: JStrack 3.3.0 is out. Version 3.3.0, among other things, includes a new map: a close-up view of the Caribbean. See the JStrack downloads section for more details. Also remember to check back from time to time in the downloads page for patches and updates that may fix problems detected by me or reported to me by users. 28 August 2010 Update: JStrack 3.2.1 is out...includes Windows EXE! Yes, I finally figured out how to make Windows EXE files for JStrack work, and thanks to help from comp.lang.tcl, it should no longer care where you install it (3.2.0 very definitely cared). Basically, the Windows EXE version is just extract and run.... Data is up-to-date as of Saturday, 28Aug2010 at 17:55 CDT. The ftp timestamp files and initial_timestamps.tcl are updated to match the storm data (I've been forgetting to do this!). This new release took a great deal of effort and some minor re-design. I've tested just about everything I can think of, and fixed a few self-inflicted errors in that re-design along the way. Please contact me at the e-mail address shown below if you have any problems, questions, comments, etc.. Watches and warnings are now "plotted" as text written into a text window. The previous releases should have been 3.1.x, but were not, so this one makes that step up. This release includes and improves the plotting of watch/warning zones, and changes the console (for testing, etc.) to TkCon for all systems. This release is mostly aesthetic changes, e.g., toplevel menus (such as the plot-point menu), etc., that could go off-screen and thus require the user to move them back on-screen now fix themselves, text widgets now use black/white instead of Tk's usual black/grey, etc.). It also moves old storm data (except for 2007) out to another file. The old storm data was no doubt getting annoying for users with slower connection speeds who had to download it over and over again.... So it's moved out (still available, but by itself). So, what's the number-one thing JStrack has really been missing? Yeah, documentation. Well, I'm hoping everyone will like the docs I've put together since releasing 3.0.0 (and 3.0.1, which fixed a few things I found while working on the documentation). So here it is: JStrack Documentation (PDF) (NEW!). This covers everything from installing Tcl/Tk (required to run JStrack) to installing, configuring, and using JStrack. It also covers how to join the WX-ATLAN e-mail list for getting updates via e-mail. This is basically a quick patch based on some minor glitches I found while doing the first cut (w/o any typesetting, still unfinished, etc.) at the new documentation. Includes the new documentation as of today. Yes, folks, I finally decided to call it version 3. The big thing stopping me was the plotting of city/location names, and this morning, I saw the whole solution (or at least, one that would work) in a flash...and then proceeded to implement what I'd seen in that brief instant. After that, I decided it was time to officially make version 3.0.0 a reality. See hrdean_GoesE_18-2100z.jpg for a sample of what I'm working on now...specifically, getting satellite imagery loaded on the tracking plot (optional, requires netpbm, or at least, a portion of it). I have now officially beaten the hell out of the cancer that attacked me. On my diagnosis day, I told my oncologist that, very much contrary to the 50/50 odds he'd just given me for simply getting out of the hospital alive, I WAS going to beat the cancer. That was the only acceptable outcome at that time, and still is. I am still unable to work, still living on a disability check, and still dealing with the long-term (15–20 years in some cases, a lifetime in others) recovery issues. Some of these may slow me down at times when updates need to be made to JStrack, so please be patient. Fortunately, JStrack is pretty stable at this point...until, that is, someone (perhaps you) sees somthing missing and lets me know (or, of course, I see it). Yes, JStrack is freeware. I have no intention of charging money for it now or in the future. After all, one of the reasons for writing it in the first place was to address the lack of a freely-available hurricane tracking program for Unix! It just wouldn't make sense to turn around and charge for it.... I do, however, have an important request. If you use JStrack, I really need your feedback. If there's anything that could make JStrack more useful for you, letting me know is the first step toward making that happen. See below for the e-mail address. If you REALLY love JStrack and want to send money, I ask that you send it to the Red Cross/Red Crescent, Salvation Army, etc., and specifically, not to send it to me. Of course, you're not required to donate to anyone. Folks who are looking for a tracking program for an area other than the tropical Atlantic, please note: at this time, JStrack does not currently support your region of the world. HOWEVER, there is NO reason why it can't. Note that I am no longer able to help with this, but if you're familiar with Tcl and Tk, you should be able to tweak the existing code to work for you. I'm not saying it'll be easy, though (a lot of the code you'd need to work with is from my early days working with Tcl/Tk, and while it's correct code, it certainly could have been written better, making it easier to work with). Good luck. If you get a version working for other oceans, please send a copy to me so I can get it posted here. Basically, you need a tracking chart for your region in a GIF, JPEG, or other image format that you can convert to a bitmap. The coordinates on the chart need to be something that you can read, but that's about it. Once you have that, the rest is simple! the location where I can ftp it or fetch it from a web site, and I'll The filter program for the NHC advisories may not work for you, but you might be able to fix that, too. JStrack is named after my two cats (at that time), Jack and Shadow. I wasn't satisfied with any name I'd come up with, and was trying to think of a name...and there was Shadow, just sitting there staring at me like he had something to say on the subject.... The rest is history. If you have any comments, suggestions, bugs, etc., regarding JStrack, please let me know. Send e-mail to me at spooky130u AT gmail.com. I've only glanced at it, but it looks like a great resource for patients and survivors alike.